Team Edge program, those last few items are non-negotiables. 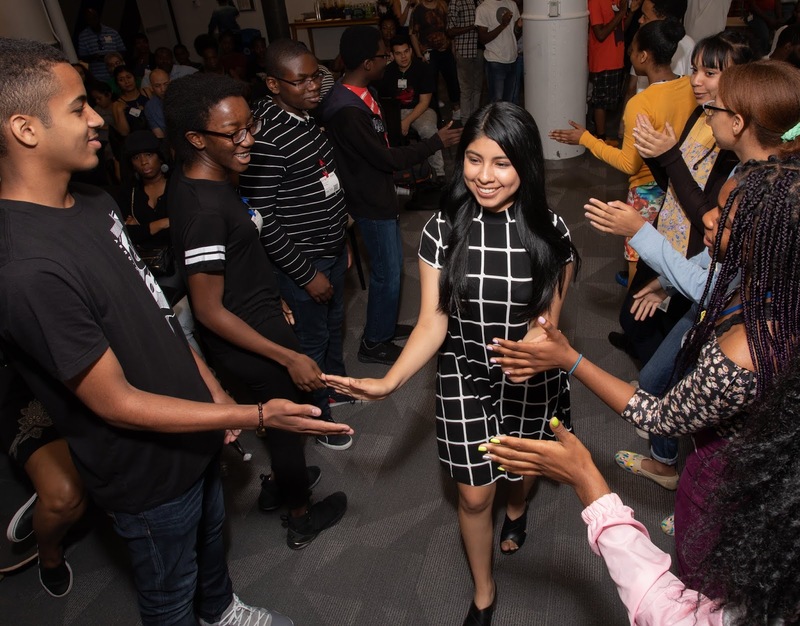 New York City’s Andrea Fernandez gets high fives from her fellow Code Next students. Code Next, a free, Google-run computer science education program for Black and Hispanic high schoolers, started nearly three years ago as an idea sprung from the brain of Google's Director of Diversity & Inclusion, Nilka Thomas. In a commitment to cultivating young Black and Hispanic tech leaders, Code Next’s first signature program, a ninth through tenth grade immersion experience in computer science and leadership called Team Edge, began with 37 eighth graders in two labs on opposite ends of the country — one in New York City and one in Oakland — in the spring of 2016. Now, fresh out of the tenth grade, those same 37 students have graduated from the Team Edge program with a deep knowledge of programming, several prototypes of apps and websites, and a competitive hackathon under their belts — not to mention Google mentors who met with them every week through the entirety of their tenth grade year. Oakland's Devin Mateo-Walker celebrates with her superlative award, given to her by her cohort-mates. Graduation celebrations took place in both New York City and Oakland at each cohort’s lab space, with several students sharing their work and learnings they’d collected from their first two years with Code Next. 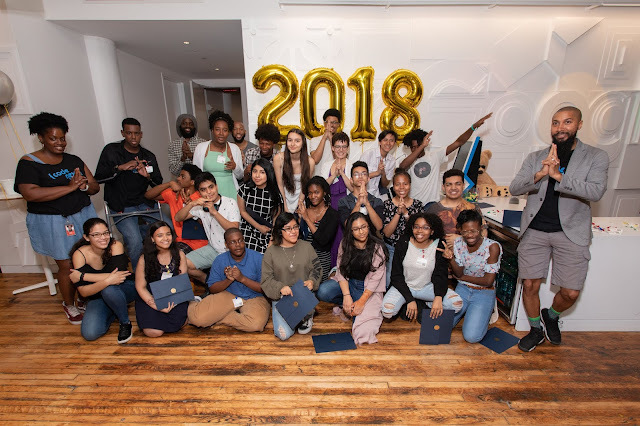 New York City’s first-ever Code Next cohort celebrates their graduation from Team Edge. “These kids are really growing into their roles as tech leaders, both here at Code Next and in their own schools and communities. It is going to be great seeing what happens when they are able to deep dive in areas of passion for each of them. We have kids who are already skilled at 3D design/modeling, animation, game development, back-end development, and much more,” says Idris Brewester, a New York City computer science coach who has been with Cohort One from the start. “But this is just the beginning,” Brewster adds. “I am excited to see them tackle those areas and use their robust foundation that they’ve developed over these last two years,” he smiles. Congratulations to these 37 students. Interested in learning more about Code Next? Sign up for the quarterly newsletter to receive updates about the program. What does it take to make a computer scientist? Equipment? Sure. Sufficient learning opportunities? Sounds about right. Passion, enthusiasm, and a motivation to change the world? According to the recent graduates of the Code Next Team Edge program, those last few items are non-negotiables.